Anybody have any experience with riding/racing tandems on gravel? Any suggestions on brands or models that I can look into? I'll bite. My wife and I are planning on a few gravel centuries this Spring in preparation for the big kahuna DK200 in May. I did it solo last year in 14 hours and she decided being from Emporia she wanted to give it a shot. I got a 2004 Raleigh Pursuit tandem off eBay for a real steal ($400!). I'm having new Velocity Chukker's built up to White Industries hubs and putting new Shimano 105 3X10 on it as well. Shoud be ready in about a week and then the training will begin!! not a racer but we ride our old clunker style mtn style tandem on gravel from home all the time. 26 x 1.75 tires make it easier and still roll good on the paved sections. I'm in the process of making final spec's for a tandem which will be used on both road and gravel. The folks at Granite Tandem Design in NH have been great to work with. They specialize in titanium tandems. The bike needs to be fast on the road and then with quick and easy changes I want to be able to head for the gravel. Tandem wheels are expensive so for now we're looking at one set of wheels and just swapping the tires and cassette. The frame and brakes will allow up to 60mm tires, but those would be for off road adventures and there are no plans to do that. If nothing else, the gearing would be a poor choice for real off road riding. The stoker will get one of the Ergon suspension posts to help smooth out the ride a bit. I'll be posting some questions the the parts category as I'm looking for opinions and recommendations on electronic shifters. The tandem will be outfitted with S&S couplers for travel so SRAM's wireless eTap is interesting as I wouldn't have to fuss with derailleur cables. I'm a retro kinda guy so eTap is scary and I know I can always dial in a mechanical derailleur. Any thoughts and/or advice on tandem experiences are welcome. Someday, I may replace my old R1000 with a bike like this. One other piece of advice that was given to me when I bought my 'Dale to ride with my wife, "Whatever direction your relationship is going, a Tandem will get you there faster!". I'm still married to the same tandem partner. My tandem is a nightmare on gravel – mostly because putting a couple hundred pounds on one tire means they sink deep into sand. Sand is a nightmare. For gravel, I would want big fat 26” tires (55mm or more). I have a thudbuster (ST) for the stoker. I love my ergon (on my gravel bike), but think I would want the extra cush and travel of a thudbuster on my bike. (60mph? I’ve overheated rim and drum brakes doing 40 going down hills in Europe – that is always an interesting experience – fortunately the tubes take a couple of seconds to lose all their air). (I don’t know how old my Trek is, but it’s a 21 speed, lol). Bob, Chas - Thanks for the insight. The gravel I'm planning to ride is quite smooth so I'm hoping the Ergon will be sufficient. Since I can see the bumps, and have the luxury of a saddle suspended in the center of the frame, I think I'll be ok without a suspension post. I'll also start with wider tires for when we do gravel. The roads I'm planning to ride generally are in very good shape but will have some washboard but little or no deep stuff. Larger volume tires, especially if running lower pressure, will be less susceptible to over heating. Many of the tandem folks I know run narrow (25 or 28mm) tires on the road and will regularly run their tires at the absolute max rated pressure. A hot rim will increase the pressure of a lower volume of air of a small tire much faster than a larger tire. Going geek for a moment... P=nRT/V but the volume V is proportional to the square of the outer radius so a larger diameter tire will hold more air which will require more heat from the rim to raise the Temperature. I expect a thicker or a 2nd rubber rim strip would also help slow the heating of the air in the tires but I have no idea if the difference is significant or not. Bottom line, larger tires should definitely increase safety margin. One other safety item is that for a given air pressure, larger/wider tires and rims increase the stress on the rim. In short: a 28mm tire at 120 PSI will put much more stress on a rim's bead than a 23mm tire at the same 120 PSI. The higher pressures will increase fatigue and a shorter life of an aluminum rim. Leonard Zinn did an article and has some lengthy replies to his article. I'm running the 650b x 48 Gravel Kings on my tandem. They're fantastic on the road, so much better than the 27 x 1 1/4"s that were on it before. They do a good enough job on the dirt roads around here and I think the bigger mass and longer wheelbase of the tandem lets it punch through soft spots. I'd love to try something around 55 or 60mm but the frame won't fit anything that big. Thudbuster in the back for sure, that was a requirement. On this bike I can only fit a ST, on my previous and future tandems I'll have the regular travel version. Gearing is 30/43/53 with a 12-34 8 speed cassette. It is possible to take some ISO disc hubs and cut threads in the disc mount area to fit them with a drag brake. For it to fit you'd also have to size up the axle wider, so you'd be doing something like taking a 135 hub and adding spacers to the right side to get it to 140 or wider. Greg, since you are in Colorado, you may have heard of my shop. I am the founder and former owner of Tandem Cycle Works of Colorado. After almost 19 years, we sold the shop. That was three years ago. We were leading tandem only tours while we had the shop, and continue to lead tours. We now do tours as http://www.TandemBicycleTours.com. We have experience riding multiple tandems with various brake configurations. Both of the tandems we are riding now have disc brakes, and I would not want to be riding a tandem with rim brakes, and a drum brake. Yes, the rotors can warp if overused. But if I were to be using rim brakes in the same situation, the tires would’ve been blown off from overheating the rims. Rotors are not flat when new, but will still work when descending a steep mountain pass. Stopping distance with disc brakes is also significantly shorter than using rim brakes with the drum. That means I don’t have to hold onto them as long because they will slow me down much sooner than any rim brake. Also, rim brakes do not work as well as disc brakes in wet or dirty conditions. Rim brakes become sandpaper, while disc rotors are still clean. Last fall, I sold our 2014 CoMotion Carrera CoPilot. Earlier this year, I built a 2018 CoMotion Carrera Copilot. I did that to build a new tandem with SRAM Etap. While I could’ve converted our previous Carrera, I didn’t want to have a bike with unused cable guys hanging around. Our gravel tandem is a CoMotion Java Rohloff CoPilot. In June, we did a tour of Germany, Austria, and the Czech Republic. One of the tandems with us was the first tandem Granite sold. Our touring tandem is built around 26" wheels, and we've taken it on numerous unsealed roads over the decades, though the majority of it's life is spent on the bitumen rather than on gravel. We normally run 2" - 2.25" tyres on it (lately Schwalbe Marathon Supreme 26x2). The frame is a custom built by a friend, as there was no off-the-shelf production frame remotely suitable that I could order 30 years ago, and the wheels are 36h Mavic rims on Bullseye tandem hubs. Our experience is that with wide rims/tyres and dishless tandem hubs, more than 36 spokes are not needed for reliability, as we've never broken a spoke or had a wheel go out of true, in spite of the bike spending a lot of its life fully loaded for touring. 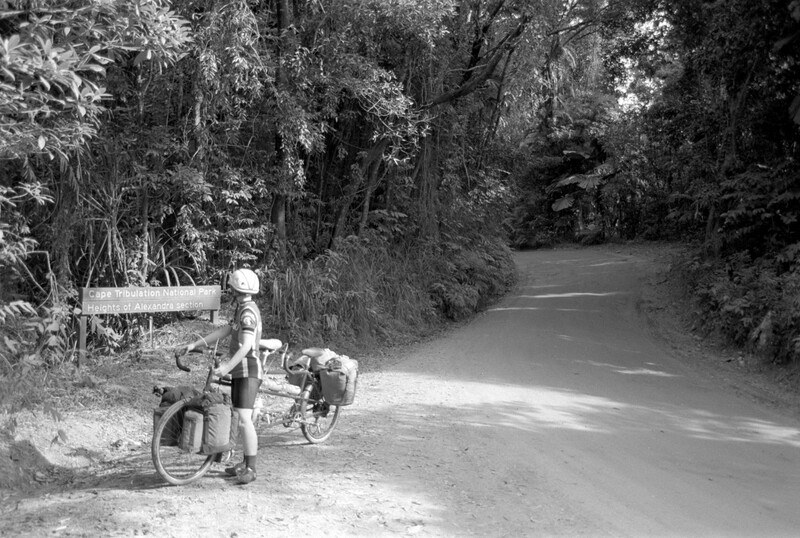 Here's a couple of photos from a 1988 trip on largely unsealed roads in far north Queensland on the way up to Cape Tribulation. First image while waiting for the ferry to get across the Daintree River on the way up to Cape Tribulation, second image taken a few kilometres further on. Thanks for all the info and sorry for a somewhat belated reply. I decided to go ahead and go with a setup I know will work for now which is to use rim brakes and a disk to be used as a drag brake. The fork will be setup for a 203 mm disk brake so if in the future I decide to go fully disk I plan to simply add a disk to the front and will keep the back unchanged. Patrick - no I haven't heard of your bike company but alas until recently we haven't been doing much tandeming. I'll be in touch to find out more about your tours and where you tandem in Colorado. Wow, I never thought of that, but I have a fair amount of experience with it. Its interesting when doing a group ride that includes tandems, you do a rest brake at the bottom of a hill and after about 5 minutes hear what sounds like a loud gun shot. Hot rims strike again. From my personal experience this is what happens if you have heat issues while rolling at speed: the hot rim heats up the valve enough that it separates from the tube. 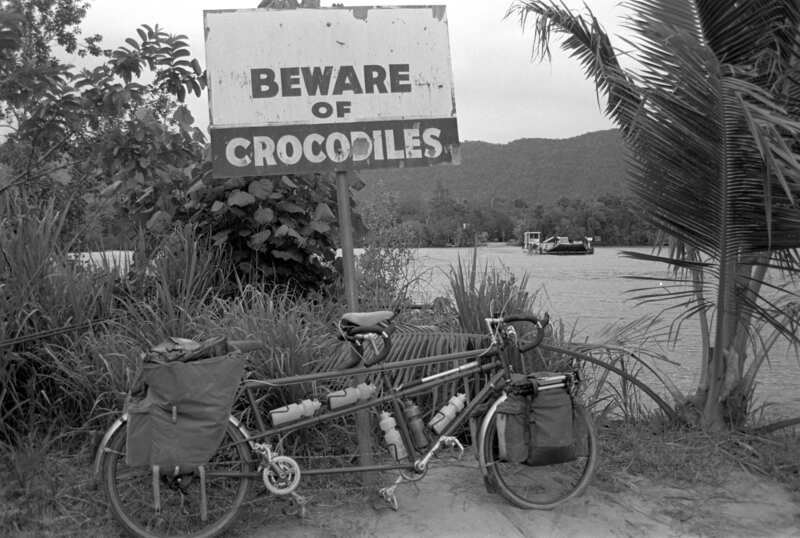 If you hear a hissing you need to slow down and get off the bike fast. Similar to getting a pinch flat (or any typical tube hole), you have maybe a little more than 30 seconds before things get really dangerous. I did have a blowout once on a fully loaded tandem (maybe 500lbs total weight). I did not thing it was heat related as we were going uphill at the time, but your explanation makes sense. I never thought of the latency effect of the heat. In that case the bike went out from underneath us instantly – it was as if we had hit a patch of glare ice. Due to the low climbing speed it wasn’t a problem, but I have never seen a bike go down so hard and fast as that (well, outside of winter time). Yikes, that's a lost of work/expense to add a drum brake! Well, there's only one modern drum brake hub left in existence (the Zenith sold by SJS) and it's only available in 40 hole. And when they're gone, I don't know if they'll make another production run. So if you really want something with a Shimano freehub, 36 hole, and threaded for a drum you have to get creative! And honestly it's not hard, you can clamp the freehub right in the lathe jaws.